I confess that Christopher Hitchens was a relatively recent literary discovery for me. I got to read his Hitch-22 memoir which was published earlier this year and I developed a liking not necessarily for his views and opinions but for the man himself. A prodigious wordsmith and a rigorous intellectual - he was truly a superior fellow. While I strongly repudiated some of his views in an earlier post, I've always been held in awe of the potency of his rhetoric. In interviews, this came across even more brilliantly. Hearing him argue was like listening to David Gilmour sing - a commanding, fatherly voice with an elegantly measured tone. Aside from his brain, it was his greatest asset. If he was drunk for the better part of his life, he damn well sobered up by the end. And a graceful end it was, calmly accepting his fate while fervently rebelling against it. It was a Camusian death, a truly 'happy' one. It seemed to me he always had this inherently human quality about him. He was the arch-nemesis of anything which rendered man soulless, be it a totalitarian regime or an illusive religion, or an empty glass of whiskey. In one of his last interviews, he said he'd like to 'do' death, to take an active part in his own 'extinction'. Rather than falling into a chronic depression, he sought to make sense of his cosmic being right to the very end. Whether it was his belligerent stance on the Iraq War or his revilement of God, you might have agreed or disagreed with him, but you would have promptly declined to take part in a debate against him. Sometimes you may not have necessarily trusted his opinion, but you could always count on his intellect. If I had to pick out a character of literature that most resembled his persona, it would be the the famous doctor and avowed atheist Desplein from Balzac's The Atheist's Mass. Desplein attends Mass strictly four times a year in honour of his dead friend Bourgeat who helped him when he was in dire straits and eventually became his lifelong companion. Bourgeat was a devoted Christian but he never challenged Desplein's outspoken atheism. Upon his death, Desplein swore to regularly hold Mass for him as a kind act of gratitude and respect for their friendship, all in spite of his clinical lack of faith. Though religiously neutral, Desplein proves his humanity and strong devotion to the person he prized most as a friend. 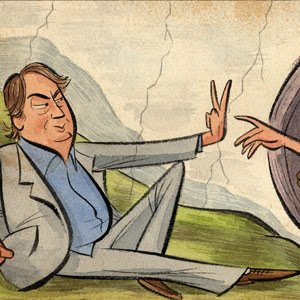 Hitchens, like Desplein, was more human than he was Christian but still less of an atheist than he was human. He embodied the principle of not denying anything but nevertheless doubting everything. Indeed, as intelligent doubt transcends blind faith, humanity transcends religion. This is how it is on Earth. Is it the same in Heaven too? It should be, otherwise it would be Hell. May the Hitch rest in peace.